There’s no mistake, Asylum 13 hand-rolled premium cigars strive to do things in a BIG way. If you’re searching for a BIG smoke, these cigars are what you’re looking for. 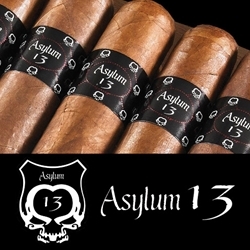 Handcrafted at the famous El Aladino factory in Honduras, Asylum 13’s highly skilled cigar rollers carefully bundle up these big boys in Nicaraguan Habano wrappers and stuffed them full of pure homegrown Nicaraguan ingredients. These giant premium cigars will give you a nice slow and cool burn with long ashes to help provide for a relaxing smoke at the end of the day. Whether you go BIG or go traditional, just go Asylum and grab one of these great premium cigars today! Try one of the varieties of sizes and flavors listed below. Each of these styles are available today for a discount price! Call us for more details!